Bangladesh Military Academy (BMA) is the training institute for the officer cadets of Bangladesh Army. It is located in Bhatiary, near Chittagong Hill Tracts, in the Chittagong District of south-east Bangladesh, about 13 kilometres north of Chittagong. The Academy is situated on the slopes of the Sitakunda hill ranges and the shore of the Bay of Bengal. Major General Anwarul Momen is the current commandant of the Academy. 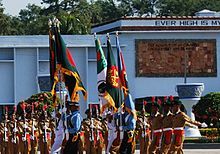 Following the independence of Bangladesh with the break-up of Pakistan in the Bangladesh Liberation War of 1971, Bangladesh Military Academy was established Chittagong Bhatiari in January 1974 for training of officers of the Army. The Military Academy was opened by the initiative of the then Prime Minister Sheikh Mujibur Rahman. The BMA maintains most of the traditions of British founded Pakistan Military Academy, Kakul including structure, Cadet Uniforms, Patches, entitlements and marching traditions. The Academy was initially raised at Comilla Cantonment on 29 November 1973 and later relocated at Bhatiary in 1976. This Academy was awarded National Standard in the year 1979. Bangladesh Military Academy provides training to the officers of the Bangladesh Army. From 1983 the officers of the Bangladesh Navy and Air Force must take three months training from the academy. The Academy chose a verse by national poet Kazi Nazrul Islam, Chiro Unnata Momo Shir (translation: ever high is my head) as its motto. Regular long courses commenced from 1978. The first batch of officers of Bangladesh Army graduated from the academy in 1975. An officer cadet shall lead a life of honour and integrity. He or she shall not lie, cheat or steal. BMA provides military and academic training and character building. The Academy primarily trains men and women to be commissioned into the Bangladesh Army. In addition, the Academy conducts and orientation course for Bangladesh Civil Service (BCS) officers, officer cadets and midshipmen of the Bangladesh Air Force and Navy respectively, and Pre-Commission Training for professor/teacher under-officers of Bangladesh National Cadet Corps (BNCC). Long Course cadets graduating from this Academy fall under Bangladesh University of Professionals (BUP) curriculum. The academy has the intention of fostering and inculcating those attributes in an Officer Cadet (OC) which will ensure his continuous and progressive development as a regular officer in the Bangladesh Army, and developing future officers for the Bangladesh Army by training the Officer Cadets in a way that they can make decisions as and when required by the military profession. Long Course – 3 years. BMA Special Regular Course – 24 weeks. Basic Military Training Course – 24 weeks. Joint Services Course – 10 weeks (Bangladesh Navy cadets and Bangladesh Air Force cadets). Potential Platoon Commanders Course – 05 weeks. Drill Instructor Course – 07 weeks. BCS Officers Orientation Course weeks (01 week in BMA) – 05 weeks. This includes lecture, tutorial discussion, model discussion, tactical exercise without troops, demonstration and field training exercise on all types of major and minor operations of war. a. Exercise Bajramusti (Iron Fist) - To impart the basic knowledge to the cadets/ trainee officers about formation of troops in patrol. b. Exercise Padakkhep (Onward March)- 1. To enhance the physical and mental endurance of cadets/ trainee officers in forced march in a difficult terrain. c. Exercise Padakkhep (Onward March) – 2. To enhance the physical and mental endurance of cadets in forced march in x-country route/ terrain. d. Exercise Dhumketu (Comet). To impart practical lesson to the cadets/ trainee officers in planning, preparation and conduct of raids. e. Exercise Maranfad (Death Trap). To impart practical lesson to the cadets/ trainee officers on planning, preparation and conduct of ambush. f. Exercise Lauhakapat (Iron Gate). To impart practical lesson to the cadets on the technique and mechanism of positional defence at company level within the frame work of an Infantry Battalion. g. Exercise Ronoghati. To impart practical lesson to the cadets in the application of principles, mechanism and conduct of day advance and attack at company level with special emphasis on platoon activities. g. Exercise Lalghora (Red Horse). To impart practical lesson to the cadets in the technique of conducting minor operations behind enemy lines without being supplied and support from own side. h. Exercise Kashti Pathor (Acid Test). To impart practical lesson to the cadets/ trainee officers in all type of major operations of war. a. Map Reading Exercise. To impart basic knowledge about Map Reading to the cadets and trainee officers. It includes Outdoor exercise on Map reading, Night marching, Uses of Global Positioning System etc. b. Demonstrations & Tactical Exercise Without Troops(TWET). Various Demonstrations and Tactical Exercise Without Troops on different operations (Major & Minor) are conducted in BMA for cadets throughout the term. c. Weapon Training. To impart practical knowledge on handling and use of various types of weapon and develop firing efficiency. d. Physical Training. To attain the highest standard of physical efficiency. e. Field Engineer Training. To impart basic knowledge on field engineering. f. Computer Training. To impart first hand knowledge on computer handling including MS word, Power Point and use of internet. g. Signal Training. To impart working knowledge on wireless and signal equipment. This training is mainly conducted to prepare the cadets of long courses for qualifying in the Bachelor of Arts(BA)/ Bachelor of Science(BSc) (Pass Course) examinations.From 67 BMA Long Course there will be a common degree. That is Bachelor of Defence Studies(BDS).From 75 BMA Long Course there are 8 subjects to study : International relations, BBA, ECONOMICS, PHYSICS, COMPUTER SCIENCE & ENGINEERING, ELECTRICAL, ELECTRONICS & COMMUNICATION ENGINEERING, MECHANICAL ENGINEERING, CIVIL ENGINEERING. Besides, the academic training also aimed at developing communication skill both in English and Bangla through oral and written expression, create awareness of current national, regional and international affairs, widen mental horizon and sense of reasoning. Training visits are conducted for the final term cadets in each term. To develop the courage, confidence level, physical and mental stamina of a cadet, this club started its journey in the year 1989. Cadets of 2nd term & 3rd term can be the members of this club. The third term cadets near the end of term get an excellent opportunity to carry out rappelling from hovering helicopter. This club was established to give the cadets basic knowledge of horse riding.Cadets of 2nd term & 3rd term can be the members of this club.This club has horse of various origins like Arabian, Indian, Pakistani & Bangladeshi. Normally the members of frogman club join Frogman Course. To meet this thrilling event, members of this club must have both physical and mental endurance. The frogman course is conducted under direct supervision of Bangladesh Navy. Cadets and Officers are awarded with Insignia after successful completion of course. The aim of this club is to find out the hidden talents from the cadets.It is one of the glorious opportunity to flourish their talents. The aim of this club is to ensure recreational facilities of cadets. Necessary equipment can be found there. This club works on educating cadets about computer. Make them confident about handling of computer. BMA has two publications namely CHIRO UNNOTO MOMO SHIR (EVER HIGH IS MY HEAD) is BMA magazine and PADAKHKHEP (ONWARD MARCH)a professional journal. Both the publications published once in a year. The Academy provides a three-year academic programme combined with intense military training. It is affiliated with the Bangladesh University of Professionals and provides 4-year bachelor's degrees. Every cadet has to study Military Science in this institution. They've to learn every thing practically. Troops of Training Support Companies. The academy has a Mosque. ^ "General Dalbir Singh Suhag Meets Bangladesh Army Chief to Boost Military Ties". Retrieved 9 August 2016. ^ "UN appoints Bangladeshi as force commander of Cyprus peacekeeping mission". Retrieved 9 August 2016. ^ "Bangladesh 'fully committed' to UN peacekeeping as vital element of global peace and security – UN Force Commander". UN News. 2018-02-08. Retrieved 2018-02-28. ^ "Consider '71 spirit in giving promotion". 24 July 2016. Retrieved 9 August 2016. ^ "Resist evil forces, PM to army men". 14 January 2016. Retrieved 9 August 2016. ^ "Bangladesh Military Academy – Banglapedia". en.banglapedia.org. Retrieved 9 August 2016. Heitzman, James; Worden, Robert, eds. (1989). Bangladesh: A Country Study. Washington, D.C.: Federal Research Division, Library of Congress. pp. 227, 230. Hossain, Golam (1991). Civil-military relations in Bangladesh: a comparative study. Academic Publishers. pp. 58–59. This page was last edited on 1 March 2019, at 19:56 (UTC).